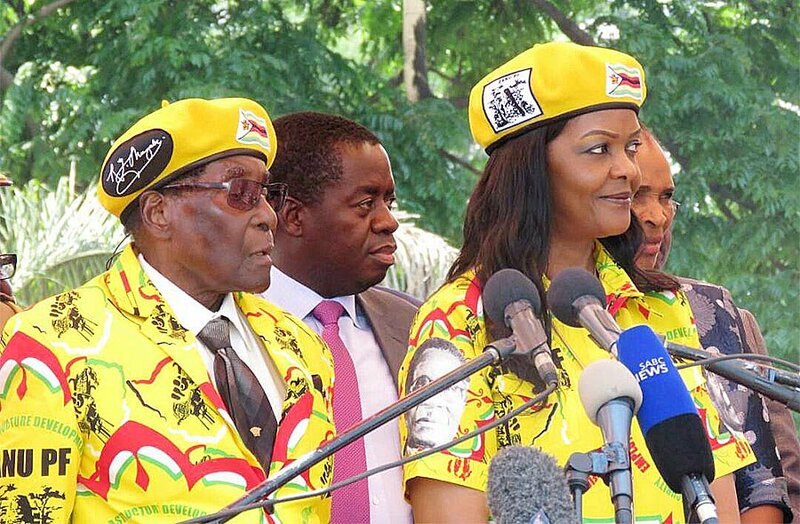 13:47 - First Lady Dr Amai Mugabe takes to the podium and denounces traitors: “Pasi nemhanduuuu,” she says in the trademark of former VP Mnangagwa style drawing laughter from the crowd. 13:50 - Going deeper into the Bible, Dr Amai Mugabe says the Bible implores people to request for serenity and wisdom on things one can not change. 13:52 - ”As Women’s League, we support you Mr President. We will always be there in good and bad times. 13:59 – “Pamberi neZanu PF, nekutevera gwara, neYouth League, nemadzimai. Pasi nevasingade kubatana nevamwe . . .,” President Mugabe begins his address. 14:00 – “Let me start by thanking you, youths. We have always said it that to us, the sun is setting but to youths, its just but rising. 14:13 – “Since the sun is rising, they have a long way to go. But as they journey along, they have to follow gwara remusangano. Gwara iroro harirase. 14:14 – “There are some people who thought since the sun is about to set, they can deviate from the norms. No, we do not tolerate that. It doesn’t matter you have been with the President for so long. It doesn’t matter whether you were invited by the President, says President Mugabe. 14:17 – “The same applies with leadership. You cannot be a leader through short cuts. 14:18 - President Mugabe thanks the youth league for organising the Million Man March adding that on the day of the march, VP Mphoko was full of delight whereas former VP Mnangagwa sat looking down embarrassed by the success it had turned out to be. 14:25 - He narrates the build up to the youth league trip to Sochi in Russia. “Ndozvatinoita in our free country,” he says. About what happened in Bulawayo, President Mugabe said he had knowledge of the shenanigans that were being organised. ”As Amai stood to address, I heard sounds, people booing. When he rose to greet the crowd, the same people were jubilant. President Mugabe has told the gathering here that he has known for some time, of the plots by his beleagured former deputy. 14:26 – “People were ferried from Kwekwe using school buses to come and boo Amai and cheer VaMnangagwa as a way of trying to portray him as popular. 14:27 – “What led to the expulsion of former VP Mnangagwa is what caused Mai Mujuru to be shown the exit,” says President Mugabe. Mujuru, according to President Mugabe wanted to compete with him. But Mnangagwa played the loyalty card yet scheming and aligning people for future take over. He would mislead people and if what he told them does not come to fruition, he would conjur up other lies again. 14:30 - President Mugabe says his former deputy lacked the supreme discipline and he would infiltrate the structures trying to influence rebellious conducts. 14:31 – One can not be a leader, President Mugabe says if they do not have discipline. 14:32 - President Mugabe has castigated tribalism adding that people are just the same. “You can not claim to be the greatest because you come from a particular province. We are one people. Sibanye, Simunye. Tirimunhu mumwe chete, tirivanhu vamwe chete. We are one people,” says President Mugabe. 14:33 – “There were people who were now claiming they are the greatest. They are Karangas. No, we do not want that. We will throw them away. ”Some will mourn and say they lost their leader. Ehe, you have lost your leader because he had become a deviant. We have kicked him out for the same reasons that saw us chasing away Mujuru. He even assisted us to force her out but we didn’t know he was assisting us so that he could do the same. 14:35 - President Mugabe says his former deputy lacked ideological orientation and proposes he goes back to a school of ideology. 14:40 - His Excellency has apologises to Bulawayo Province.